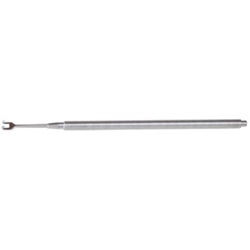 Straight shaft, double prong hooked tip, sharp tips. Flat handle. Overall length: 128mm. 1.5mm spread between curved tips. 2mm spread between curved tips.